Anti-government protestors burn tires in Budaiya. Source: Reuters. The “Arab Spring” that began with the self-immolation of a vendor in the streets of Tunisia spread potently throughout the Middle East-North Africa (MENA). The small country of Bahrain in the Persian Gulf was also hit by the wave of the regional quest for political transformation in 2011. Due to the crisis caused by street demonstrations against the royal family, the 2011 Grand Prixin Bahrain was cancelled. Nevertheless, this year Grand Prixin took place in April 2012 resulted in worsening unrest in the country. Essentially, this Formula One race yet again reminded the world of the ongoing uprising in Bahrain rooted in sectarian divides. To understand the situation in Bahrain it is critical to study the demographics and contemporary history of this country. One of the drawbacks of the “Arab Spring” is that instead of analyzing the individual characteristics of the countries of discussion, we group them along with other regional unrest. While it is impossible to isolate the situation in Bahrain from the ongoing unrest in MENA, an accurate analysis of the recent events requires a contextual understanding of this country. With the population of 1.2 million and a GDP of more than 25 billion USD, Bahrain has one of the most diversified economies in Persian Gulf and is home to a number of multinational firms. Despite a rather successful strategy to diversify the economy of Bahrain an example of which is a Free Trade Agreement (FTA) signed with the US in 2006, Bahrain remains heavily dependent on oil. A major hub for international finance and Islamic banking, Bahrain suffered financially due to the unrest of 2011. Presently, the country is at the risk of losing financial institutions that have made Bahrain home to their multinational business. Economics aside, Bahrain’s key challenge lies in the deep sectarian divide between Shiites and Sunnis in the country. As Sunnis dominate the ruling elite, the Shiite majority that constitutes around 70% of the population demands more rights and power from the constitutional monarchy of King Hamad bin Isa Al-Khalifa. Thus, the “Arab Spring” is not the first instance of demonstrations and objections to the ruling Sunni elite in the country. A creation of the British, today Bahrain enjoys the support of Saudi Arabia and the US. There are also hypotheses that Iran supports the Shiite opposition of this country. Despite what is commonly portrayed in the media, protests are by no means a new phenomenon in Bahrain. An example of this unrest took place in 1997. The literature of these demonstrations and violence is strikingly similar to what we read in the news today about Bahrain. In early June 1997 firebombing and streets demonstrations along with state repression resulted in deaths and injuries. These demonstrations had already begun in 1994 due to frustrations over unemployment, discrimination and the refusal of the ruling elite to meet the public quest. Despite its high literacy rate and a comparatively high development rank in the region at the time, Bahrain was a repressive monarchy with a high rate of discriminatory unemployment. As Joe Stark of Human Rights Watch writes in 1997, “The great majority of Bahrainis can read and write, but thousands of them, mostly young Shiite men, do not have jobs.” Similar to today, there were discussions of the Saudi-backed state repression and an Iranian support reflected in the violence used by the Shiite opposition. A series of protests, outburst of street violence and state repression resulted in some degree of reforms in the country. When King Hamad bin Isa Al-Khalifa took over the monarchy after his father in 1999, he initiated economic and political reforms aimed at improving the fragile and damaged relation of the kingdom with the Shiite majority. As such, with the official establishment of the constitutional monarchy, the first round of elections was held in 2002. While about half of the eligible voters participated in this legislative election, some opposition Shiite organizations boycotted the elections which resulted in about one forth Shiite MP seats. Despite domestic tensions, things seemed more or less calm in Bahrain until the “Arab Spring” unrest that significantly agitated the country. The eruption of unrest in Bahrain in early 2011 led to the government calling in the Saudi military to violently end the protests. The majority of protestors had come out in the streets of Manama, the capital, to demand more say for the Shiite population and to put an end to the systematic sectarian discrimination in Bahrain. Inspired by the “Arab Spring” sentiments to seek justice and democracy, thousands of demonstrators set out at the center of Manama in what became known as the “February 14th Revolution”. These protests resulted in deaths, imprisonments, injuries and exile. In response to the worsening situation, the King finally formed an independent committee to investigate some of the killings and cases of torture. Publishing a report in November 2011, this committee revealed the systematic use of torture and serious violations of human rights in detention centers. Due to the unrest, clashes, and crackdowns, the Formula One race was cancelled in 2011. This year, however, the Formula One race took place in April 2012. Despite the common belief that this event would lead to more unrest and violence, the royal family went ahead with this international event while fully prepared to violently confront the protestors. The opposition forces, too, stepped up the protests with tactics such as burning tires, improvised explosive device (IED), etc. Protestors set out and chanted slogans such as “no Formula One Racing over our blood”. Essentially, violent confrontation of governmental security forces and the opposition reached a climax during this time while Formula One went on in a bubble of its own. In fact, the unrest and bloodshed still continue. The month of May has also seen a number of instances of violence as the protestors object to the killing, imprisonment and torture those captured during the Formula One games. Formula One which was the largest international event since the “February 14th Revolution” led to the empowerment of a rather new radical opposition group, Asab al-Thawra. This group was responsible for issuing threats and other instances of opposition violence in objection to Grand Prix events. Some believe that the Islamic Republic of Iran must have also had a hand in empowering the more radicalized opposition. Regardless, calling all the opposition radical and violent would be simplifying the situation. There must be young and old protestors who still believe in peaceful civil disobedience tactics and strategies against the government. However, the escalating violence has resulted in the further radicalization of the opposition along with the employment of further repressive strategies by the government. It is unlikely that the Shiite opposition, as radicalized as it has become, will succeed in overthrowing the King. The Saudi support of the ruling family is strong and even if Iran fully supports the Shiite opposition, the chances of a quick transformation are slim in Bahrain. To calm down the situation, the government might introduce more systematic reforms while maintaining the repression of dissidents. However, it might be too late for reforms given the present aggravation of the opposition and the seriously damaged relations of the state and the opposition that is turning into insurgency forces. With the ongoing violence, Saudi Arabia will be more aggressive in making certain that the current Sunni elite will remain on power. By now, Iran has seen the potential that the Shiite opposition bears in determining the future of Bahrain and will naturally carefully strategize its tactics in this country. Meanwhile, there seems to be little interest in the international community to intervene in the current escalation of violence in Bahrain. Further, as a financial and banking hub, Bahrain cannot afford to let protests interrupt the life and business of expats in the country. Similarly, to protect its interests, the business community in Bahrain is likely to support the Sunni ruling elite by further marginalizing the Shiite professionals while perhaps helping a few local token Shiites rise to the top as a way to demonstrate an illusion of equality aimed at pleasing the international community. Ultimately no matter the human cost, the state has to at least secure a reasonable degree of security and stability in order to maintain its economic glamor. 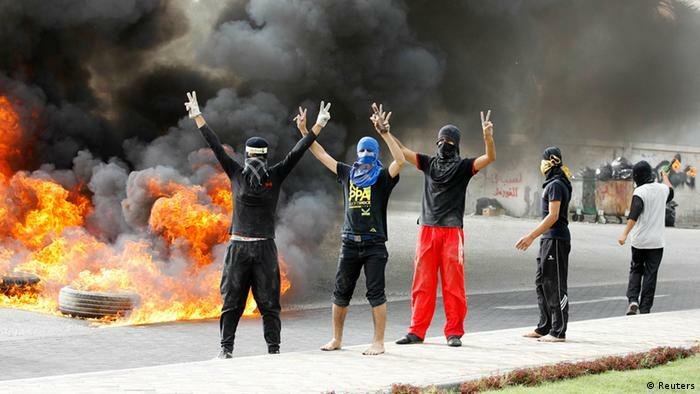 In essence, Bahrain’s Spring seems far from today’s realities.